In St. Petersburg, Russia, world chess champion Aleksandr Bezetov begins a quixotic quest: launching a dissident presidential campaign against Vladimir Putin. He knows he will not win, but a deeper conviction propels him forward. And in the same way that he cannot abandon his aims, he cannot erase the memory of a mysterious woman he loved in his youth. In Cambridge, Massachusetts, thirty-year-old English lecturer Irina Ellison is on an improbable quest of her own. Certain she has inherited Huntington’s disease—the same cruel illness that ended her father’s life—she struggles with a sense of purpose. Then Irina finds an old, photocopied letter her father had written to the young Aleksandr Bezetov, in which he asked the Soviet chess prodigy a profound question: How does one proceed in a lost cause? Since he had never received an adequate reply, Irina travels to Russia to find Bezetov and get an answer for her father, and for herself. With uncommon perception and wit, Jennifer duBois explores the power of memory, the depths of human courage, and the endurance of love. 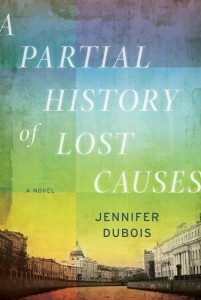 The story in A Partial History of Lost Causes by Jennifer DuBois is told in chapters that alternate between two narrators: Aleksandr Bezetov and Irina Ellison. The novel opens in 1979 when Aleksandr Bezetov was in training in Leningrad/St. Petersburg and on his way to becoming a world chess champion. Chapters follow Aleksandr into the 1980's and then quickly become current. Irina's chapters begin in 2006 when we learn of her father's long protracted bout with Huntington's disease and her diagnosis to suffer the same fate. Irina finds a copy of a letter her father had written to Aleksandr years ago, asking him what is the proper way to proceed when you know you’re losing? Aleksandr had never replied to her father's question so Irina feels compelled to travel to Russia to ask him for his answer to the question her father posed to him years before. When Irina arrives in Russia, Aleksandr is running for president against Vladimir Putin. Since Aleksandr is a chess champion, the game and symbolism from chess play a major role in the novel - if only in it's constant presence. Having the chapters alternate between characters from different parts of the world imitates the two distinct players in a chess match. Even the surprising actions of the characters could mimic strategic chess moves. All the characters are faced with carrying on with their lives while facing lost causes, just as a chess match continues and players follow the rules even while knowing that, in the end, someone will lose. In this case both players (characters) seem fearful of life as they both face the ultimate formidable opponent: death. DuBois is clearly a very good writer and she displays a wonderful way with her prose. To her credit it's actually hard to believe at times that A Partial History of Lost Causes is her first novel. There were several sections I'd love to quote just so others can experience the beauty of her writing but in this case, since I was reading an advanced reading copy, you will have to follow the link below for an example of her writing. She does an admirable job setting the tone and place with her descriptions. I thought DuBois was equally proficient in capturing Irina's current life in Massachusetts as she was in describing Aleksandr's life and struggles in the Soviet Union in the early 1980's. On the other hand, while I enjoyed the novel, there were some drawbacks for me. The set up leading to Irina's sudden departure to Russia, leaving everyone behind and events leading to her prolonged stay in Russia seemed almost too sudden. Eventually, I did end up feeling somewhat detached from the characters. This isn't always the case when I am presented with novels where the main characters are dis-likeable or self-absorbed, but, as A Partial History of Lost Causes progressed, my interest in what would happen to both Aleksandr and Irina lessened. A Partial History of Lost Causes is a dark, somber tale - part psychological character study and political/historical thriller, it is highly recommended. 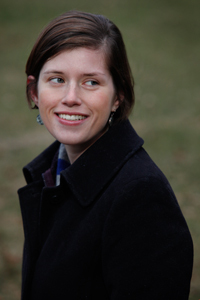 Jennifer DuBois is a recent graduate of the Iowa Writers’ Workshop and is currently completing a Wallace Stegner Fellowship at Stanford University. Originally from western Massachusetts, she lives in Northern California. Disclosure: For the TLC Book Tour and review purposes I received an advanced reading copy of this book from the publisher. The Day The World Ends- and a Giveaway!